This convenient compact curling iron features a cordless design with no need for plugs or batteries. This curling iron includes a handy carry case. The idea is great - a portable curling iron that you could even keep in your purse for touch-ups! However, this product did not come with the brush head that was shown in the picture. The length of the silver barrel that you wrap your hair around was quite short. When turned on, it did not heat up. A total waste of money. This small curling iron is great for quick touch-ups! Added to that, you can travel by plane with it in your purse! I love it and highly recommend it. Perfect curling iron to keep in your purse- and great pricing from Overstock. In my opionion,Overstock never fails to deliver...easy to order, free shipping and great prices! butane can be scary; it is small, compact and heats fast, but i don't know what happens when the butane is used up, or how long that might take. and what about travel on an airplane? We received product damage free. At this time I am unable to say much more because it is a christmas present for my daughter. Item received was not what was pictured. Return was simple and refund was quick. "Do you sell the refill for this product"
"I am in Australia and need to know if you ship this product here. I need more Thermacell cartridges and cannot buy them here. If you do ship here I would be interested in buying the Conair ThermaCELL Cordless 0.625 inch Curling Iron and extra cartridges from you Regards, Jane"
Hello shelties222. For assistance with this issue please contact Customer Care at the number below. I hope this helps, thank you for shopping with us! U.S. and Canada Toll free: 1-800-The-BIG-O (843-2446). I have used this product before and was very happy with it. compact and cordless for travel internationally. I have used it before and found it very helpful especially when I travel. "What curling iron uses "Conair Cordless Curls ll " butane cylinders ??" Hello buck, we do apologize, we do not currently offer Conair Cordless Curls II. We do not have inventory to verify recommendation. Thank you for shopping with us. "Does this curling iron come with a brush attachment?" Hello Shalls, this does not come with a brush attachment. Have a great day! "are there replacement cells avail and how long does one last?" Thank you for your question 1browncar. With no plugs or batteries needed, you can use this styler anywhere. The replaceable Thermacell butane gas cartridge lasts for months of use. It's compact: The styler’s neat, portable size makes it easy to store away or pack up for travel. It also heats up fast, no waiting. This iron reaches ideal styling temperatures in only 2 minutes. Butane cartridge included: No messy refilling. Replacement cartridges are available from your favorite local retailer. 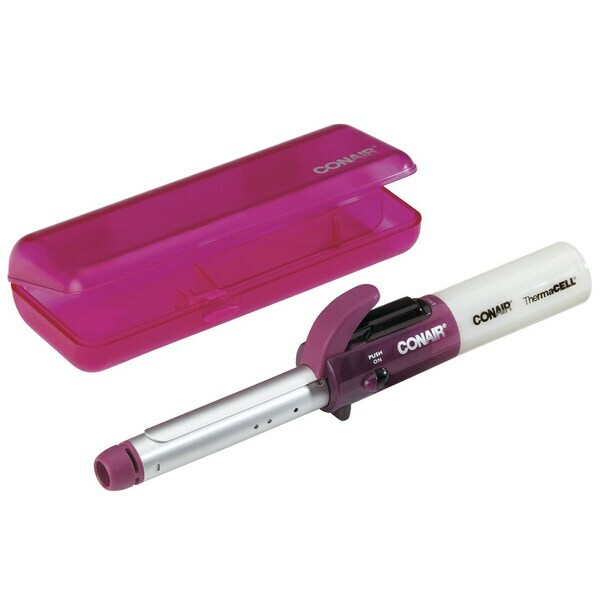 Use only Conair Thermacell butane cartridges in your curling iron. Please feel free to contact us again with any further questions. "What size is the curling iron?" The size is 0.625 inch.